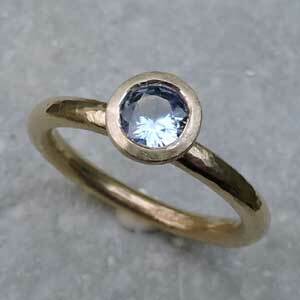 Light Blue Sapphire set in a Gold pillow on ‘Affinity’ style 3mm Engagement Ring. Choose this ring in either 9ct or 18ct Gold. This Sapphire measures approx. 5mm diameter and weighs about 0.70 carat. Each stone is an individual, so the colour can vary slightly. We always choose the best quality stones we can find. Individually handmade and slightly irregular, the ring shank is lightly hammered and the Gold is hand brushed, to give a satin finish. 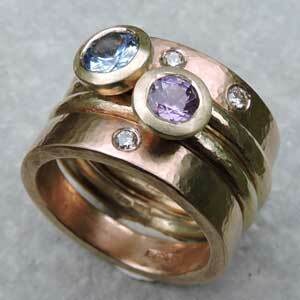 Engagement rings are made to order. Allow 4-6 weeks when ordering Gold Rings. The time scale will depend upon how much work we have on. If you have a particular date in mind, please let us know and we will do our best. Our engagement rings are handmade to order. We will ensure that your ring is a good fit.